- Reebok Ladies 3.0 Ounce Express II Jacket. 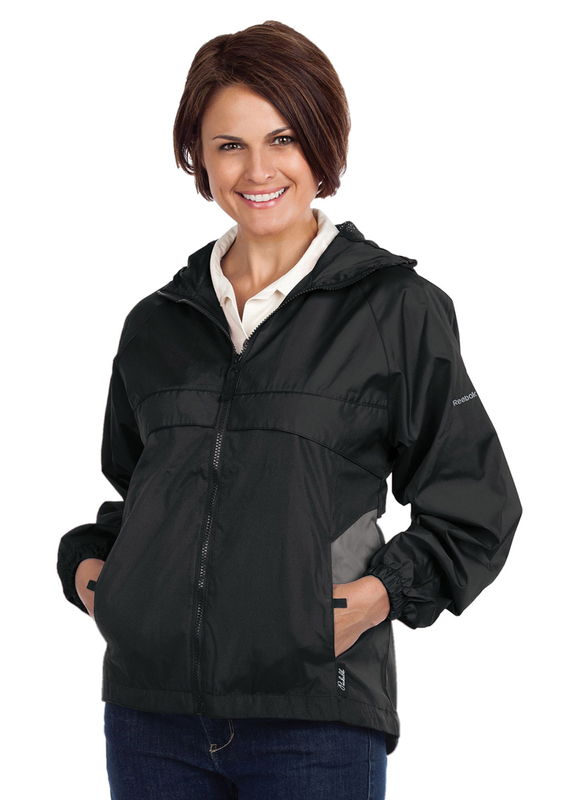 - 3 ounce 100% polyester wind and water resistant jacket with caped back with ½ mesh lining for breathability. - Chest pocket packs into the security hand warmer pocket. - Drawcord at bottom hem. - Reebok embroidery on left bicep. - Style ships from Eldorado Springs, MO. Reebok Ladies 3.0 Ounce Express II Jacket.3 ounce 100% polyester wind and water resistant jacket with caped back with ½ mesh lining for breathability. Chest pocket packs into the security hand warmer pocket. Hidden hood. Drawcord at bottom hem. Elastic cuffs. Reebok embroidery on left bicep. Machine washable. Style ships from Eldorado Springs, MO.Sizes: S-4XL: Black/Graphite, Black/Red, Dark Navy/Ice.